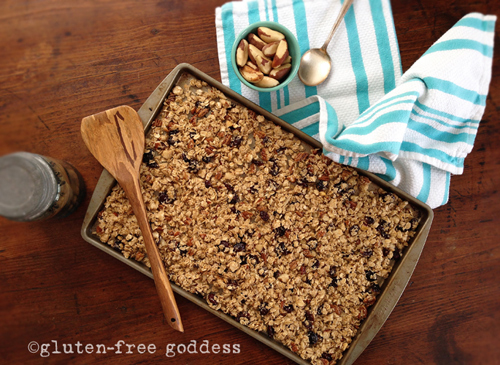 Gluten-Free Goddess Recipes: Homemade Gluten-Free Granola - So Good! 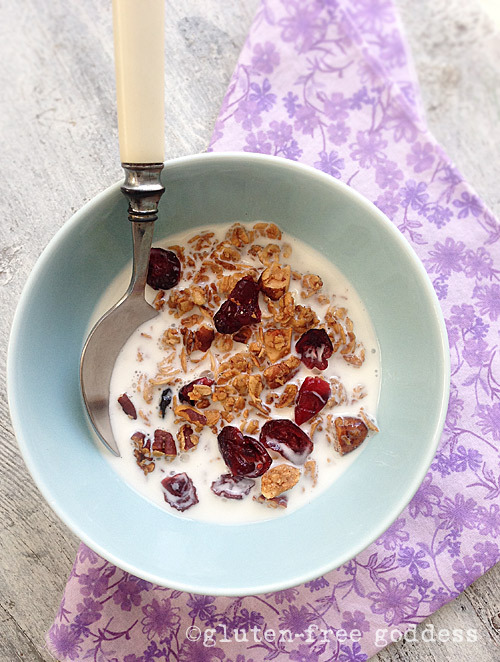 Homemade Gluten-Free Granola - So Good! You're going to think this is silly. What I have to confess. And it is. Quite silly. It's one of those sticky, pesky truths that clings to you and won't let go, wreaking not anything dramatic, like pure havoc (or worse). No, nothing life threatening, or socially isolating, or disturbing, or even controversial, for that matter. So I'll just say it. I've been too scared to make my own granola. Well, maybe scared is too strong a word. Color scared with a hint of lazy and you might have a more accurate hue of where my head's at, granola-wise. And making your own granola always seemed a trifle precious. A tad earthy-crunchy (duh). Slightly over the top. And rather unnecessary. It's not like granola isn't widely available- in an array of flavors- since Jesus was in Hebrew school. It's a serious, bonafide hit. A blockbuster cereal. For, like, evah. Why bother making it when you can buy it by the Trug load? Number 1. Cost. 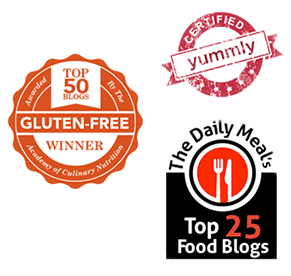 When my husband stopped buying a certain gluten-free granola he liked, ever curious, I quizzed him why. Do you know how much it costs? he tossed back. Sniffing slightly. (Sadness? Ennui? Disgust?) That little bag of two, maybe three servings, he said. It's nine fracking dollars. Dude, I whispered, sitting up straight. That's heinous. Number 2. For those of us blessed with a heaping bowl of celiac disease and all kinds of extra toppings like casein allergy, and FODMAP intolerance (why on Earth would you add INULIN to fiber-rich oats? ), and a general, all purpose, mid-life pie-roll aversion to sugar coated cereal, it's not an entirely bad idea to create your own gluten-free granola from scratch, using body friendly ingredients, and lower fat and sugar. So for those of you out there who are already experts at whipping up batches of homemade gluten-free granola- Dear-hearts, I salute you. My wooden spoon firmly in hand. You are far more fearless and intrepid than mild mannered Yours Truly, who might more accurately be called, She Who Runs From Oats. I am She Who Bakes Granola. Can I be on Portlandia now? Be sure to use only certified gluten-free rolled oats in your granola. 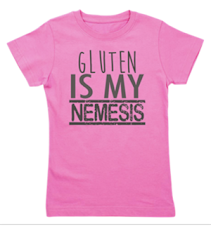 The important emphasis, here, is on certified gluten-free. Not hearsay. Not wishful thinking (aka denial). I used Bob's Red Mill Gluten-Free Rolled Oats (the package sporting the Gluten-Free symbol) because it tests as gluten-free. And no, Bob didn't ask me to say this. He doesn't even know I bought a bag. Or made this fabulous granola with four cups of it. If you happen to run into Bob, up there in Portland, tell him I said, Hey. I added organic Brazil nuts to my nut mix, because I wanted to boost those hard to come by minerals- selenium and zinc; and add some vegan protein. I added dried cranberries because they're FODMAP-friendly, but you can choose raisins, if you prefer- or your favorite dried fruit. And the only sweetener I used was pure organic maple syrup. This is a good base recipe- friendly to those of us with FODMAP sensitivities. And you can add in your favorite fruits, seeds, coconut, etc- after it cools a bit. Have fun! 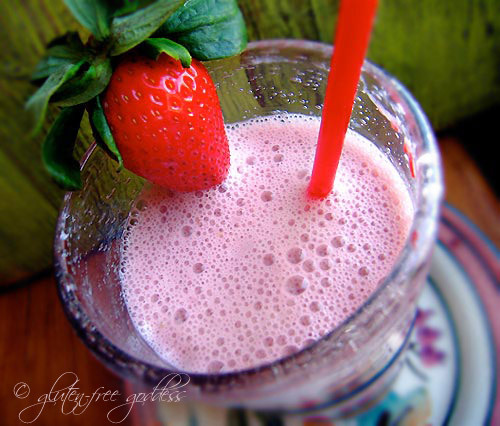 Recipe posted March 2014 by Karina Allrich. 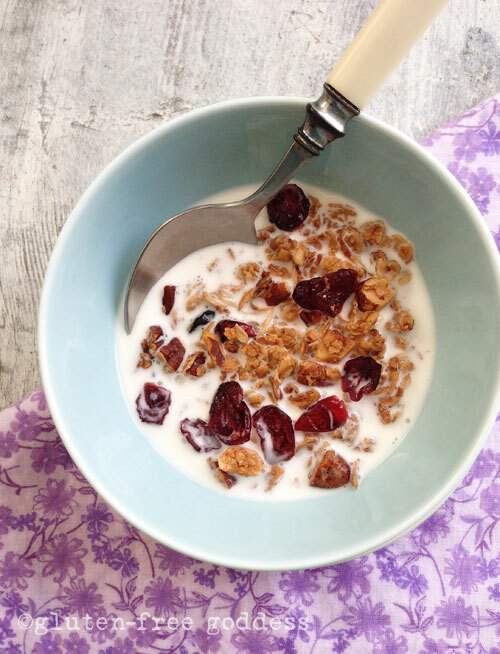 Easy, super-tasty vegan friendly granola. No sugar. No honey. Sweetened only with a modest amount of pure maple syrup. Switch out the dried organic cranberries for your favorite fruit, if you prefer. Preheat the oven to 325º. Take out two baking sheets and set aside. In a large bowl combine the rolled oats, Brazil nuts, and pecans. In a glass measuring cup, combine the maple syrup, olive oil, cinnamon and sea salt. Mix well with a fork. Drizzle the syrup mixture over the oats, and stir as you go. Gently keep stirring until all the oats are coated with the syrup blend. Spread the granola mixture onto the two baking sheets. Bake in the center of the oven for roughly 25-30 minutes until golden and toasty. Check the granola half way through baking time to stir gently. Remove from the oven and allow the pans to cool a bit. Pour the cooled granola into a large bowl. Add in the dried cranberries and stir.